Want to feel the balmy breeze of Bali Shifting you away in the air, almost flying like? 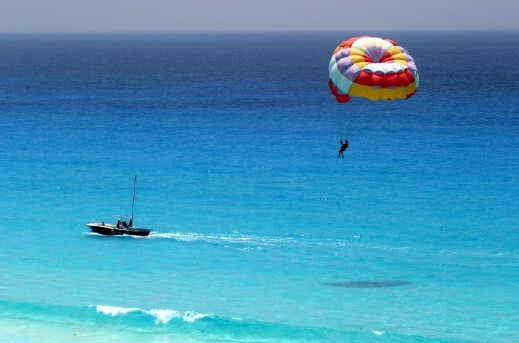 Well Parasailing in the gorgeous coastal area is just the thing for you if you think flying 95 meters above sea level , hanging on to a parachute pulled by a speed boat is fun and enticing. You would find many parasailing guides in Bali Indonesia who will ensure that you are all geared up with safety equipment strapped on you and would guide you with tips and advices before flying off to experience it all. From taking off on the white sandy beaches to landing back on the gorgeous coastal area this sport is a definite adrenaline rush in to the system. Parasailing is one of the most popular marine sports activities in Bali among locals and foreigners. You do not need to be an expert in sailing or be a paratrooper ( as they refer to the veterans of parasailing). The parachute which is used is suits each passenger according to the individuals weight. You can even choose the colour of the parachute you would like to fly. The complete time in the air will be around four to five minutes. It’s a sport enjoyed by couples as well as families who visit thus beautiful coastal area. All you need to wear is suitable clothing for ease and comfort while flying. Application of sunscreen is advisable for the couple of minutes you spend getting ready, flying and landing. This is just one marine sport out of the many that you could try while in these gorgeous surroundings. Bali is known for its perfect atmosphere for surfing, swimming and snorkeling. And when you need a break from all that sun and sea, retire to a gorgeous Bali luxury villas to catch some snooze in style. If you are on the look out for Bali resort villas then look no further than Alila Villas Uluwatu .These stylishly decorated villas are perfect to spend your Bali holidays, and will ensure a relaxing experience by the sea. In your own private villa, complete with an in- room plunge pool and every comfort that you can think of. Wouldn’t you feel a little more than pampered? White Water Rafting in Bali – Ride the River Rapids! Located on the western end of the Lesser Sunda Islands of Indonesia is the island of Bali. Known for its development in both traditional and modern forms of dance and arts, it is one Indonesia’s most popular tourist destinations. The island’s rich culture, history, ecology, scenic beauty, and overall serene ambience are some of Bali’s most notable features, making it one of the most visited islands in the region. Those looking to soak up the island’s stunning natural beauty can stay at Alila Villas Uluwatu, a hotel offering Bali luxury villas, ideally located high upon limestone cliffs overlooking the ocean. This stylish yet elegant hotel provides a range of wellness based amenities, along with a wide variety of hospitality and leisure services making it an excellent hotel to experience Bali resort villas. Owing to its geography and thriving tourist industry, the island offers tourists a wide range of leisure and adventure activities. One such activity which is both adventurous and adrenaline-pumping is white water rafting. Being home to several rivers with raging rapids and swells, it is sure to offer you a truly heart-pounding rafting experience, the likes of which you will not forget! White water rafting, considered by many to be one of the more extreme water sports, invites you to ride the raging torrents and rapids of a river flowing in full force. Apart from being tossed about and being splashed by the waves as you challenge the currents of the river, the activity offers a great deal of fun and excitement. Bali has several rivers flowing through green forests and other beautiful natural scenery which is an added bonus of taking part in this activity. Battling through the rages of a flowing river is no easy task, and is sure to be challenging, yet it is the satisfaction of rising up to this challenge that has kept many people coming back for more. Two of Bali’s most popular rivers for rafting are the Ayung River and the Telagawaja River, which flow through beautiful scenery and pack a lot of adventure. These rivers are also known for their heart-stopping river drops and raging rapids which are sure to give you an unforgettable adrenaline rush! Rafting Centres such as SOBEK Adventure Rafting, Ayung River Rafting, and Bali Adventure Tours will offer you the equipment you need, along with trained professionals who will ensure your safety and guarantee you have a superb rafting experience.